France has opened an investigation into the disappearance of Meng Hongwei, the Chinese head of the international police agency Interpol. His family have not heard from him since he left Interpol HQ in the French city of Lyon for a trip back to China a week ago, police sources say. “He did not disappear in France,” a source close to the French inquiry told AFP news agency. Mr Meng, 64, is a senior Communist Party official in China. He was elected president of Interpol two years ago. The investigation was opened after Mr Meng’s wife went to police to report her husband missing. In a statement, Interpol said it was aware of reports of the “alleged disappearance” of Mr Meng, Reuters news agency reports. “This is a matter for the relevant authorities in both France and China,” it said. Interpol added that the secretary general – not the president – was in charge of the day-to-day running of the 192-member organisation. 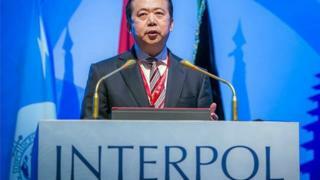 As president, Mr Meng leads the Executive Committee, which provides the overall guidance and direction to Interpol. Mr Meng’s term is scheduled to run until 2020. Before taking over at Interpol, Meng Hongwei was deputy minister in charge of public security in China. After his election in 2016 human rights groups expressed concern that the move could help China pursue political dissidents who have fled the country. But Mr Meng said at the time that he was ready to do “everything he could towards the cause of policing in the world”. Mr Meng has 40 years of experience in criminal justice and policing in China, notably in the fields of drugs, counter-terrorism and border control, according to Interpol. Interpol can issue a red notice – an international alert – for a wanted person. But it does not have the power to send officers into countries to arrest individuals, nor issue arrest warrants.